ASTRO, San Antonio, Texas · 2018, E. Graulieres et al. NBTXR3, injectable hafnium oxide nanoparticles, was designed to increase the energy deposit of the irradiation when activated by radiotherapy for the treatment of solid tumors. 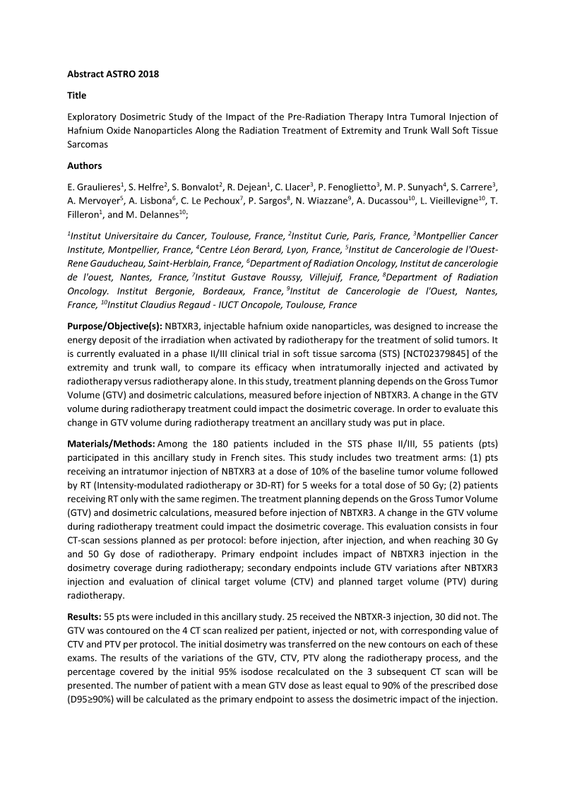 It is currently evaluated in a phase II/III clinical trial in soft tissue sarcoma (STS) [NCT02379845] of the extremity and trunk wall, to compare its efficacy when intratumorally injected and activated by radiotherapy versus radiotherapy alone. In this study, treatment planning depends on the Gross Tumor Volume (GTV) and dosimetric calculations, measured before injection of NBTXR3. A change in the GTV volume during radiotherapy treatment could impact the dosimetric coverage. In order to evaluate this change in GTV volume during radiotherapy treatment an ancillary study was put in place. NBTXR3 nanoparticles are activated by current standard radiotherapy without changing the applied dose and to increase the probability of interaction with incoming radiations to ameliorate the energy dose deposition from within tumor cells. The results of this study on the modifications of volumes during the radiotherapy treatment and their potential dosimetric impact will allow an objective evaluation of the dosimetric coverage all along the treatment period.